The core of the entire 20/20 system, this monitor gives you more information than you can get anywhere else, and it's easier to use, too. The planter monitor in your cab today delivers sanitized population data. It tells you if you are within your target planting population with about a ten percent margin of error. So if you have 5% skips and 5% doubles, your monitor is happy because you are planting at 100% population. That’s not good enough. 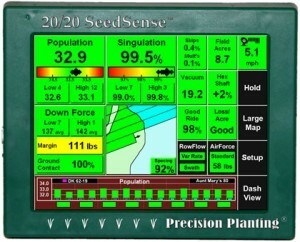 The 20/20 SeedSense® Monitor System gives you better information AND more information. Information that lets you actively manage your planter – and make changes that make you money. Population monitoring - yes, but whether there are skips or doubles and on which rows so you can correct the problem and get moving again. You will get detailed information about your row unit's ride as well as ground contact to reduce compaction but insure proper planting depth. A touch screen and simple menu instructions make this an easy to use essential planting tool!